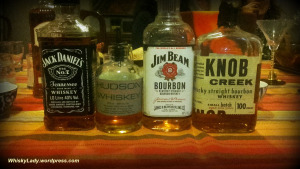 In January, the Whisky Ladies went full-on all-out American! We were joined by a special guest – Shatbhi Basu – bartender, cocktail creator and Distilled Spirits Council of the United States (DISCUS) whiskey Ambassador to India. Guided by Shatbhi, our merry whisky ladies tried each sample ‘blind’ with the great reveal only after tasting all four whiskies. Best comment on the JD was “It is like the vodka of whiskies!” as it is the kind of whisky you would enjoy in a long cocktail. Nose – Apple, like snapple ice tea, vanilla, paper and cardboard, grains, mud earth, hint of oranges? Overall – Finally something that isn’t watery! Sense of being older, definitely the most enjoyable of the four sampled. The most fun of the evening was making three fresh flavourful cocktails using the JD, Jim Beam and Knob Creek as whisky base. It was an enjoyable experience however it is interesting to see how many of our whisky ladies have clear palate preferences emerging and expectations of their whisky. This entry was posted in American, Beyond Scotland and tagged American whiskey, Hudson Single Malt, Jack Daniels, Jim Beam, Knobs Creek 9 year by Carissa Hickling. Bookmark the permalink.